During the early years of my reawakening to all that is science, I became aware of Richard Feynman (pronounced “fine-man”), the late famed professor of theoretical physics at Caltech. I had heard of him before this time, probably because he died at the UCLA Medical Center on February 15, 1988. Although I had graduated years earlier, I must have taken note of his passing because it involved my alma mater. His significance, however, did not resonate with me at the time, but I would learn over time just how much this man meant to the world of physics. If field of physics had a monarch, it would be Richard Feynman. He was not only one of most brilliant and most accomplished physicists that ever lived, he was also a global ambassador of American physics for many decades. His loss was felt by many people even outside of physics. A phenomenon that began before his tragic death from cancer and has continued to this day was the creation of the “Feynman groupie,” an exclusive club of which I am a proud member. Richard Feynman had so many accomplishments. He won the Nobel Prize in Physics in 1965 for his contributions to the development of quantum electrodynamics (QED). He developed the path integral formulation of quantum mechanics. He invented the “Feynman diagram” a pictorial representation scheme for describing the behavior of subatomic particles. He participated in the “Manhattan Project” which created the first atomic bomb. More recently, he was a member of the panel that investigated the Space Shuttle Challenger disaster. And his talk from 1959, “There’s Plenty of Room at the Bottom,” pioneered the area of nanotechnology. Any one of these accomplishments would have meant a successful career for single scientist. 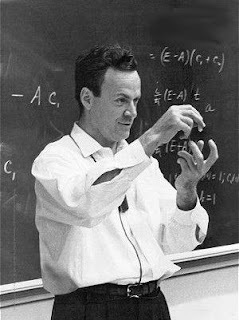 I find that all sorts of people pay tribute to Feynman in that manner as they appreciate him being a “curious character.” The description of this blog was derived in part from a book containing a plethora of anecdotes and humorous episodes in Feynman’s life, “Surely You’re Joking, Mr. Feynman! (Adventures of a Curious Character).” It seemed only fitting that I dedicate this blog after the physics world’s most famous curious character. And even though I never had the opportunity to meet Richard Feynman, it is infectiously curious scientists like him that I set out to find. Science as a Moral Compass? I Was a Science Bigot!